I'm repowering... Lost out on the 383, but have a 5.7 lined up. It's a complete 2005 drop in... 280HP as it sits, but it will be outfitted w/ some 1.65:1 rocker rollers I've got laying around (if they clear the VC's)... also, a cast dual plane square bore intake manifold w/ 700cfm holley, and that will likely push it to around 290 maybe 295 ttl.. perfect for my purposes. so my question#1 is: "will the accessory brackets from a 4.3 match up to the 5.7 casting?" If you can do the side of the hull I feel like (for me personally) it would be less nerving. I would do anything to avoid transom rot if at all possible. Besides with the chrome exhaust bezels for the side hull it would definitely look better just my 2 cents. @212 you have the perfect set-up for through hull s EXACTLY as you have surmised. There is plenty of room where you indicate you might go. 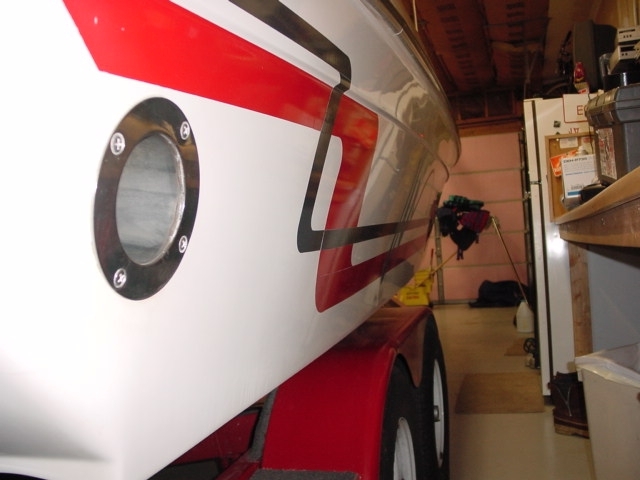 The Rinker transom /hull area is IMO the strongest in this class of boats by FAR! You will be astounded by the quality of the layup when you cut the holes out. I did my first through hulls in 1994 using Corsa electronic actuators (I really dislike the air actuated units as they are a PITA, IMO). This was done by putting a 383 into a Rinker 190. The Corsa came ready to go. I needed some high performance wet exhaust hose and some tips. I chose Gil off shore composite tips with internal flappers. 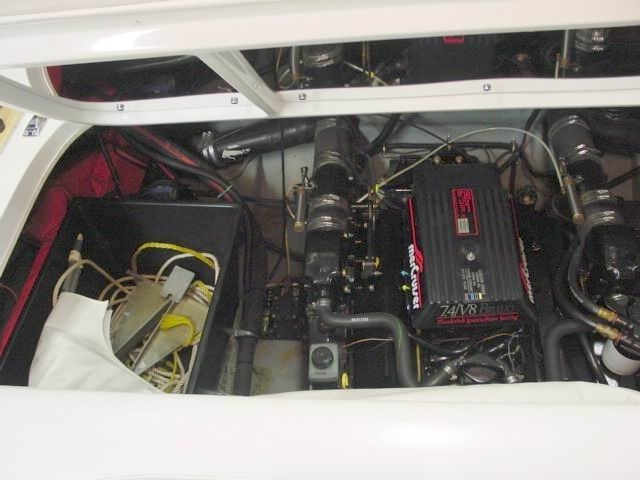 I ran wiring to a switch on the dash and later added a light to signal when it was on as if I left it on with the boat on my lift the batteries were dead fast due th the high amperage solenoids. Started on a Friday morning at about 8:30 and was finished by 3:30. It took longer LOL because I measured for the friggin' holes about 20 times before we cut! BEST THING I EVER DID FOR OUR JUST PURE FUN! The engine gained over 100 RPM ran about 5 degrees cooler in normal conditions BUT the oil temp remained much cooler longer when at WOT on lengthier runs. As for the cool factor EVERYONE loved it, even the Admiral. Sooooo - easy to do, good for the engine and AWESOME for fun. Something, IMO, that you would never regret. BTW, just my opinion, but I had side through hull exhausts in my 2011 Rinker 226 XL with 350 Magnums. They took up too much room in the engine bay. Good luck Drew! we agree on that, DI... obnoxious, is the term I would use... I wouldn't do it w/o having the ability to divert it... now what I'd like to have is a partial either way type switch... but... want in one hand, right? that said- it's hella better than choking it up the way it runs through the drive now... and, it will keep the drive cooler, as well... I'm looking at mufflers as I type this- and will have one selected soon I hope..
Time to come home MT !!! I had a 1990 236 with the Corsa stainless exhaust with the solenoid actuated polished stainless diverters. Not only did it look great, it sounded very cool with the 454 big block. I had that Rinker for 5 years and the only issue I had was the solenoids fried - but it was a quick fix by calling Corsa and getting new parts. 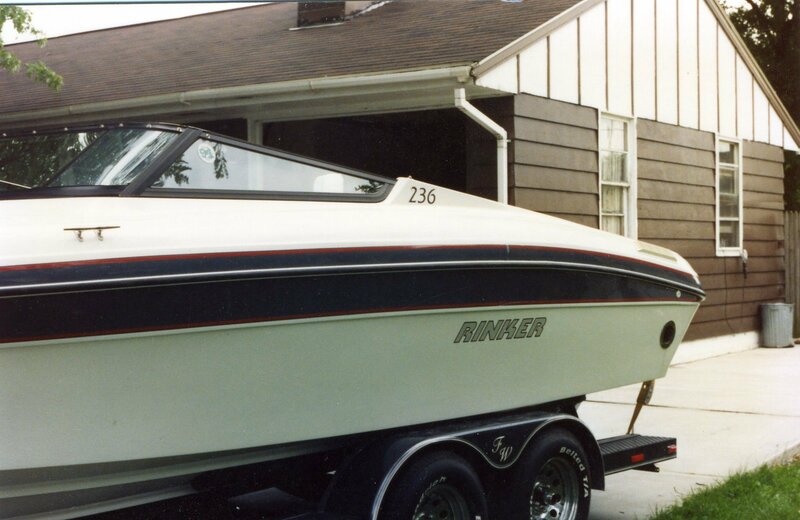 I also had a 1994 236 (454 also) with the Mercury Marine air actuated cast iron exhaust diverter - didn't look nearly as cool but still sounded great. The 236's that came with the exhaust diverters had the thru the side outlets and not thru the transom. The exhaust hoses were run pretty much up against the transom so they really didn't take up a ton of space in the engine compartment. As for the question about the 4.3 / 5.7 accessory brackets - well, the 4.3 was a 5.7 engine minus 2 cylinders, so I would guess that everything should bolt up. Of course there may be differences in engine years but you might get lucky and everything will fit. What are your plans for propping the boat once the engine is swapped? Are you talking a vortec or prevortec? If you have a prevortec 4.3 and a Vortec 5.7 you will need an electric fuel pump plus intake manifold hardware is different. Oh you will need an appropriate dipstick tube. off the back of the risers, instead of shooting straight out the transom or bending down toward the thru-top exhaust passage, I'm strongly considering mounting a true x muffler just like the one I've used before- stainless magnaflow true x... laying it at an angle, effectively lowering it's exit, and bending again toward the transom, bending yet again just enough in front of the engine rooms aft vents, and penetrating the side just below the cleats. You have a 4" X muffler? Remember to use proper clamps and hoses. PLEASE make a comprehensive photo documentation and post here. This sounds like a fascinating project that I am sure would be of great interest to many on this forum! the builder accepted my offer... Engine is inbound. I'l be more than happy to document the build. I may start pulling the drive tomorrow, as I've got a bellow kit that's been laying around for over a year.. I wonder how much more load will be on the engine without the exhaust aerating (cavitating) the prop in those first few seconds? So... for other users here with alpha1gen2 drives: if you're prop shopping for hole shot and low planing speeds w/o much impact on top end, I have a Ron Hill Marine Pleasure Five in s/s 19 average pitch, and 14 1/8" (or it may be 14 1/4") that is possibly up for sell or trade.. I'm thinking I'll be twirling a 22p this year, and wish like hades I hadn't sold that precision turbo2 in 22p 14 1/4" s/s to some dude on the beach who chewed his up in an oyster bed not ten minutes before I sold it to him.... for $75... I only paid $50, so I don't feel too bad about it, but you guys know it was worth a LOT more than that... and they aren't easy to find, anymore. Ok Drew, now I'm confused (happens more and more these days! LOL). What are you doing? A rebuild with no through hulls, through hulls????? I'd already picked out tips, and plumbed the thru hulls with my cursor (meaning my amazon shopping cart is loaded), and then Al breaks with that information about flow and the Alpha (1200cfm before it starts to restrict)... and... I won't be anywhere near that.. If I drop on a dual plane intake and a 750cfm double pumper, add the rocker rollers (I can't justify buying more; it will be either the ones I have or the stamped that come on the heads) the total air is still below 1k cfm..
handy, do you know what a sneeky pete is? if not, it's a custom pool cue that is on par with any custom cue you can imagine, but it looks like a house cue... it's purpose is to provide the best tool for the shooter while keeping as low a profile as possible... I mean, some dude walks into the pool hall with a custom case and breaks out a shamrock, I'm going to be careful in a 3 out of 5 with that fella- he spent that much on a cue, he likely knows what he's doing... some dude walks in with a sneeky pete, my only advantage is that I saw him walk in with it and know it's not a house cue- and I know he's gonna try to hustle somebody... and I know that somebody ain't gonna be me. I like the idea of keeping as low a profile as possible. loud exhaust won't accomplish that. I like the sound of tuned exhaust as much as the next guy, but all that noise does nothing but draw attention... that ain't what I'm about. Our 17 year old grand daughter who lives with us (long story) LOVES the sound of the 350 MAG MPI firing up when we take our 246 out. I think she would be positively giddy if we had through hull, but at our age, we kind of prefer less shock and awe! MT- that police bit... it's not that i've anything to hide from them as I don't do illegal stuff or would ever dream of drinking and running the boat- but they LOVE pulling folks around here... there are no less than six different agencies that will pull you, w/ the worst being the USCG- and only because THAT is a federal ticket as opposed for the dude checking you out, primarily, for having at least legal fish on board. I had straight out exhaust on my 351s and they had the big round barrel muffler. Can you use those?